A retail-class box that is printed in full color on all sides and rigidly constructed. Great for large-sized games. You can fit a quad-fold game board, 260 poker cards, a 40 page jumbo booklet, and a bunch of game pieces in this box and still have room left over. If you had a game based on only Poker Cards, it would hold almost 1600 of them. 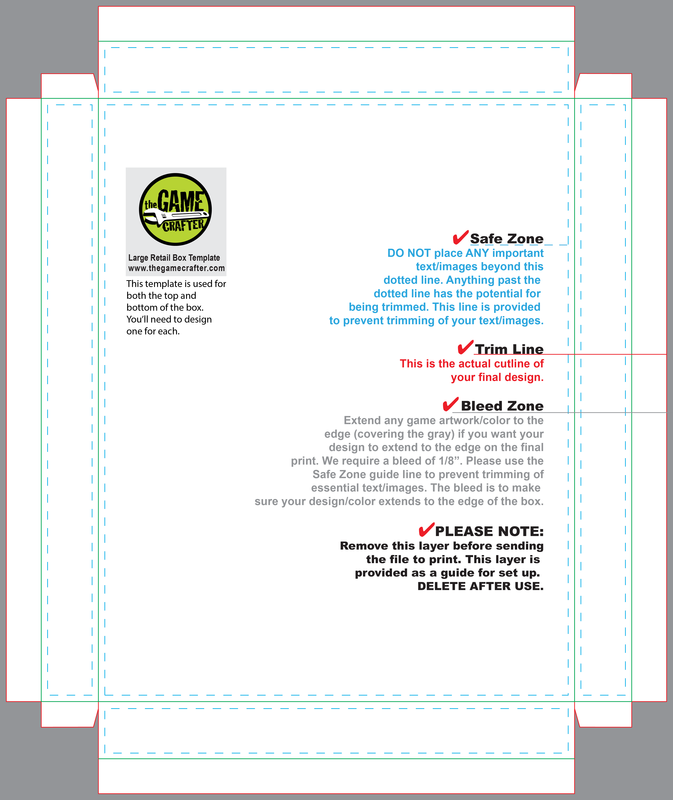 You will use the same template to create both your box top and box bottom images for the large retail box. You are responsible for making sure that the components you order fit into the box. If you add too many components for the size of your box, then we will still ship your game, but we'll have to charge extra for shipping. You can see the estimated dimensions of your game in the game editor stats. A 2 page (1 sheet) Document counts as the thickness of 9 cards and a 20 page booklet counts as the thickness of 4 cards when trying to account for extra space in a tuck box.